Which map from 2.53 do you like best? Now that the patch has been out for a month or so, which maps do you like best and why? Also, we are working towards a balance patch, especially for the new content. What balance changes are necessary in your opinion? I voted Studienka because it's the most balanced. Simple conquest is always a solid game-mode. I also love tanking on the map. The low view distance and river choke points gives tanking a unique feel. Lenino is amazing looking. But I do think it's a bit Polish biased. Less tanks for Poland and maybe bombs on FW could help. Ogledow is a bit Russian biased as well. Maybe just tweaking asset spawns in the 2nd sector could help the Germans push up to it. Ihantala plays awesome. The adaptive push helps the more tactically minded players imo, and combined arms is awesome. It's also a bit Russian biased tho. Maybe bombs for FW or tweaks to Russian tank spawns could help. All 4 maps are great and Studienka is my favourite. The atmosphere it has looks more dramatic to me. It´s dark and foggy. The rest of the maps have nice fields covered with flowers or forests. Studienka gives me a more raw feel. Besides, flag placements are great and simple conquest mode just adds for more strategy involved and that keeps me more excited than just pushing forward like on the other maps. It´s not that I don´t like push maps, but I´d rather have most maps as conquest maps. The initial vehicle convoy you see at the start of Studienka is simply epic. Lenino could have a slight tank balance tweak. The germans usually get pushed back to their mainbase and after that fail to get out. I would give some more tickets to the germans on Ogledow. I think that if they´d had like 5 more minutes to cap the last flag it would make a fine balance. The only change I´d make to Ihantala is to tweak the airplane balance. Bombers are very ineffective right now because the view distance is low and there are lots of trees, rocks and tank wrecks. It´s hard to find targets. Add the fact that there are 2 enemy fighters flying around. Chances are you won´t be able to bomb almost anything. If bombers are out of the scene, what do you want fighters chasing eachother for? I´d say planes serve no purpose to either team on Ihantala. I first answered Lenino due to its variety, but the map seems quite unrealistically balanced since the Germans rarely win the round. Ihantala offers the most enjoyable gameplay experience, overall. My favourite map is Lenino because of the new vehicles and the new poles faction, altough the other maps have an amazing landscapes. - Lenino and Studienka are balanced. - Ihantala need more tickets for the finns. - Ogledow neeed more tickets for the germans because of the stronger second sector of flags. Agree with Guarnere. I think Lenino balance is fine, Germans are learning to win the map these days. Studienka is balanced, but it is the most "unfinished" map of the bunch, the environment in the other maps feels more lively (or deadly ). Studienka is a bit too clean for my taste, a tad too arena-like. I have yet to see Finns win Ihantala or Germans win Ogledow, although I heard they won it twice now and Finns won once? I've been playing a bit since new release and thought I'd drop by. I think Studienka should have the no-go areas within the map marked somehow, maybe like Hurtgen Forest? It felt weird running out of bounds in certain spots. I've only seen Germans win Ogledow once when it was a 20v20 round and I think Russians weren't good players since they kept attacking first sector after losing it and the only challenge was the last flag. For Ihantala the winning Russian strategy seems to be to go for eastern flags, you get the Bridge-Lake-Highway-Crossroad cluster and it's the 4/7 needed to sway ticket bleed, the flags are closer together than the other 3 and thus easier to take and reinforce. My favourite map so far is Studienka. and half of the map is not playable because of this (the brits rarely reach the 2 final flags). -Alam Halfa: Bring back the Valentine tank please. Originally there were 1 in the final british flags, but if possible add 1 more in the first 2 flags. Besides, Valentines were common in N. Africa as you sure know (it wouldn't affect the balance IMHO: Stukas, LeFH 18, Pz. IV F2 can easily kill them). -Siege of Tobruk: Reduce the points (from 900 now to ¿700 or so? ), because is a matter of time that germans win the map 90% of the times. Also, ¿more cover to the 25 pdr maybe? -Mareth: Add 1 Semovente 75/18 (and replace a Marder III). Not because of the balance, but because the 75/18 is awesome . -Lebisey: Seriously, this map needs more points. The map ends after 15 minutes, I don't know how many points it has (400? ), it's clearly insufficient. -Omaha Beach: In 2.52 it had a lot of points. It made sense because it was hard for the yanks to conquer the beach, now in 2.53 it makes no sense anymore. The players know how to play it. -Op. Cobra: The spawnable Panzerfaust has balanced the map for the germans a bit, which it was neccesary. But if possible, add at 1 more AA system for the germans (static or mobile). -St. Lo: Increase the points a bit (no more than 200), so the yanks have more time in taking the Hill. -Villers: Currently 900 points, which makes it one of the most long maps in FH2. 700 points or a bit less would be perfect. -Pegasus: Too many points too. Easy win for the germans most of the rounds. -Hurtgen: Ditto but for the yanks, and also I would reduce the cap. areas (the south flag is very easy to capture for example). -Bastogne: It needs a bit more points. Too hard for an average USA team defending 3 flags at a time. -St. Vith: Maybe it goes against the historical accuracy but, can the yanks have artillery and a couple mortars?. The germans win most of the times. -Sammatus: Is possible that the soviet mortar is bugged? -Seelow 32p: Adding a 82 mm soviet mortar. All of these unbalancing issues is what I feel they need to be changed, in my experience playing online. What do you think about my old maps suggestions above? Am I right, totally or partially wrong? Impossible to perform for the next patch? I can throw in my 2 cents. This map actually gets a bit of balancing love in the next patch. Not exactly increasing the cap radius, but tweaking assets to give the Brits an advantage in the early stages. Also some better spawning I believe. We'll see how it does, since I think this map is a ton of fun if it actually progresses like it's supposed to. I guess a dev could put it in the last flag if they want to. I'd love to see more Valentines outside of Sidi Rezegh and Mersa Matruh. but idk if it's appropriate in the first line flags. Tbh this map is pretty balanced (in terms of close games and who wins) even if it's not so much fun for the Allies to perform a delaying action and retreat. Tbh I think this map is pretty balanced. It hasn't been touched for a while because it plays a lot like Alam Halfa. I've seen each team win pretty evenly even if the Aussies get pounded into the sand for most of the round. I think adding a Semovente would be cool. But removing the Marder would leave it only on El Alamein I think. Right now Semovente and Marder are on 2 maps each. Which I think is good considering their production numbers. I believe this will get more tickets in the next patch. I agree that it ends too quick right now. It does seem a little one sided for the Americans, so maybe it could use less points. But tbh reducing tickets so one team has less time to win is a hack ended solution. Devs are kinda forced to do it because of the BF2 engine, but I think other things could be looked into instead. I agree that the Germans still need a bit of help. But AA is easily destroyed, and I think the Germans could do more with FWs that have bombs. St. Lo needs a real overhaul in gameplay and aesthetics. But no-one's really got time to put in that effort right now, so I don't think it will get changed until someone does. I agree here, it's definitely one of the longest maps in FH2. It might still be within the ballpark of 'round time' that the devs are going for tho. Still? This was a big change last patch, and I think it's really helped the Brits win more. Tbh I don't think Hurtgen needs to be touched. It's one of the best maps in the game with good progression and balance. I think you really only need to defend 2 flags as American's if you're smart. This map seems really balanced imo. It only suffers from precapping, but there's not much that can be done about it. I think this is similar to Hurtgen in that it's close, balanced and has a good progression. Bugged how? Like it doesn't spawn? Sammatus could also use other things to help the Finns breakout once they get pushed to their main base. But that also takes a lot of work. Possibly? I haven't played that map in a long time. Usually it gets played with too many people tho, so the balance is thrown off. It's straight conquest tho, so Soviet and German assets should be more or less mirrored. Thanks for the answers Matthew, good to know that some of the old maps are going to be tweaked! -You're right, there is only 1 Marder III at Mareth (I thought Mareth had 2) hence my suggestion to replacing one of them for a Semovente. I wanted to give some time to see how gameplay settled out in some of the maps before voting, but my favorite so far is Ihantala. Ihantala - I really like the combined arms aspect of this map, and the infantry combat is excellent. My only suggestion is that I think the tickets need to be reduced slightly or the bleed increased, since the map tends to drag on too long, especially if the Soviets are winning. Lenino - I also really like this map overall, it just needs slightly improved defenses for the Germans particularly at the forward flags. Ogledow - The first line of flags is fun, and the push towards the second line an interesting mechanic similar to the Ramelle where the Germans need to carefully protect their tanks. I like the idea, but this map is so damned frustrating to play as German. The KTs inevitably get taken out eventually, and this means restarting from the previous line and waiting around for the next wave of KTs. The biggest problem though is even once the Germans do take one of the second line flags, those flags are extremely difficult for the Germans to defend. Armor spawns in the main are very far away, meaning that reinforcements take ages to arrive, and the infantry spawns aren't ideal for defending the flags. Every time I've seen the Germans manage to cap a flag in the second line it falls again within a couple of minutes. This map needs some balance tweaks to avoid it getting bogged down at the second line of flags, but once those get fixed I think it will be a fun map. Studienka - This is the only map in the patch that I'm not much of a fan of. The map is pretty and reasonably balanced, and I like the very open fighting around the central bridge. However, the rest of the map feels kind of like one of the CMP maps, specifically in that it seems like players don't put much effort into defending the outer flags and instead just run around in a circle capping flags without enough fighting. I assume the bridge chokepoints were put in to try to control this, but it's kind of hard to make use of those chokepoints with the limited vision range and the few AT guns on the map. Some people clearly like the slower gameplay style of these more spread out maps, but personally I feel like this map is just too big for a conquest map. That's great! I've always really liked the core design of Supercharge, and even if the map is basically impossible to win for the Brits at the moment, they usually still advance at a consistent pace so the map doesn't get bogged down at one line of flags. 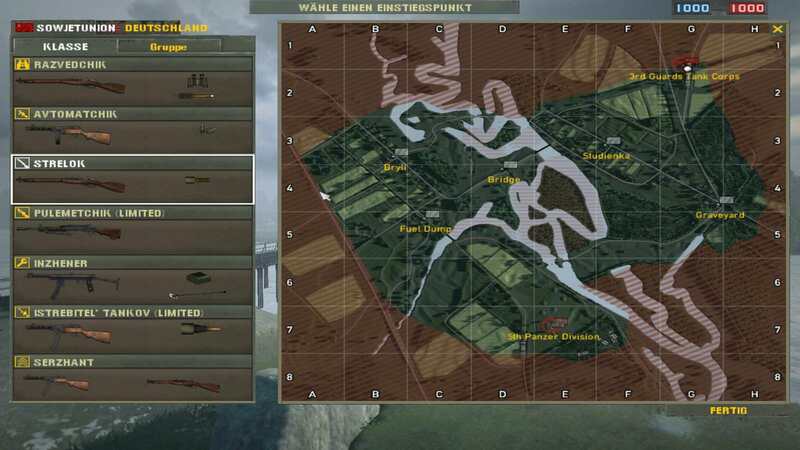 Furthermore, I think the map could be balanced somewhat easily by reworking the spawns at Ghazal Stn (specifically moving them further behind the flag so Germans aren't constantly spawning in bunkers directly in the path of the Brits), and doing something like adding a flag at the railyard south of the last city flags to give the brits a forward spawn point that can be capped with armor.